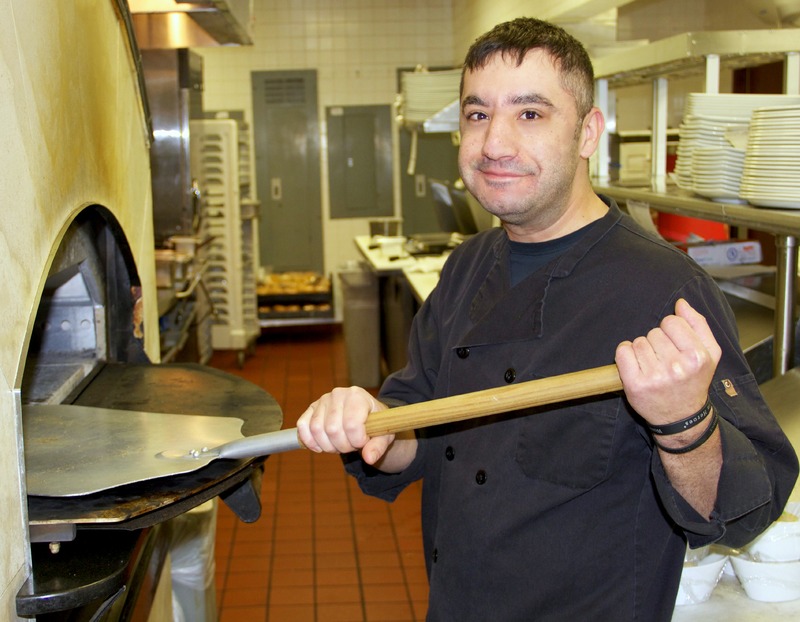 Chef Sal Zappulla is the man behind the burgers at Tribeca Tavern in North Raleigh. Tribeca Tavern offers a casual dining experience and great food at affordable prices. Not only can you order a chef’s specialty 10 oz. burger with a side for less than 15 bucks, but you will be pleasantly surprised that the burger is gigantic! Trust me, I ate the whole burger (plus fries) and my stomach thanked me. Chef Sal is dedicated to the Tribeca Tavern and Rocky Top Hospitality mission, bringing guests the best ingredients from North Carolina whenever possible. Chef Sal creates masterpieces out of local foods and is extremely imaginative in the kitchen. He once created a pumpkin spice burger with sweet potato guacamole. I haven’t heard of a chef doing that in Greater Raleigh, have you? I had the opportunity to witness Chef Sal’s creativity. I demolished Chef Sal’s special burger of the night, a 10 oz. 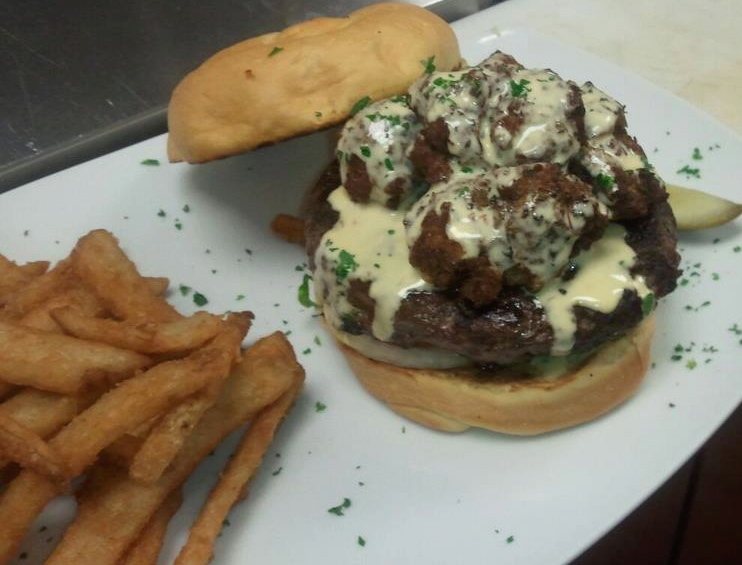 burger topped with homemade crab fritters and chipotle hollandaise. I was in burger and seafood bliss. The word “Foodie” strikes a chord with Chef Sal; his life is consumed with food and he wouldn’t have it any other way. At age 14 he began making homemade sauces and throwing pizza dough in his family’s Italian restaurant in Boston. Now on his evenings off you will find him trying new restaurants with his friends. He enjoys healthy competition and strives to make the most unique, delicious food in Greater Raleigh. Not only does Chef Sal keep his guests wondering what he’ll make next, he serves as inspiration for his two daughters, 8-year-old Hannah and 10-year old Maddison, who both love to cook. Maddison and Hannah love making homemade pizzas and quesadillas with their dad. Maddison can even use a chef’s knife, with Sal’s supervision of course. 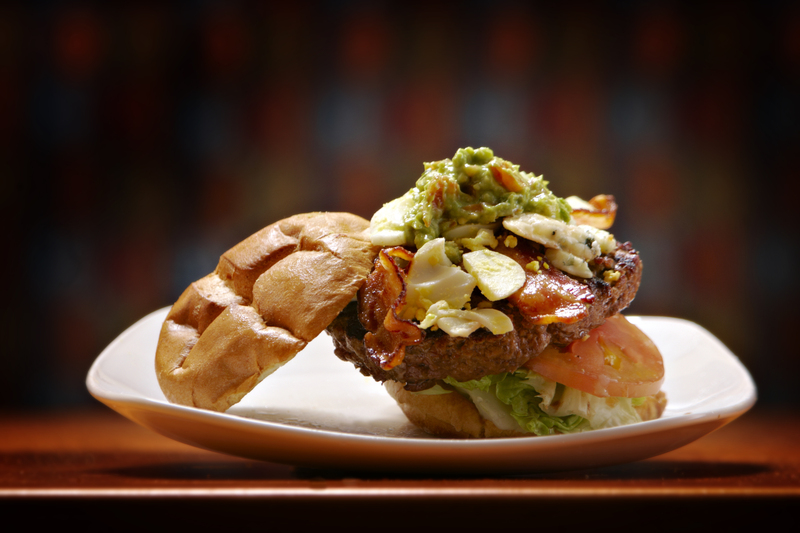 You can’t go wrong with a burger at Tribeca Tavern. The burgers are ground in-house every day and you can choose from bison, Kobe beef, turkey or lamb. Tribeca Tavern uses all-natural, grass fed Angus beef and provides North Carolina sourced meat whenever possible. Tribeca Tavern is also sensitive to dietary needs; you can order a veggie burger or a burger without the bun. Chef Sal’s favorite two burgers are the Wolfpack and the Really Mean Mexican. The Wolfpack includes two 5 oz. beef patties, North Carolina pepper jack cheese, pepper bacon, BBQ sauce, fried onions straws, lettuce, tomato, and onion. Chef Sal loves junk food and bacon. 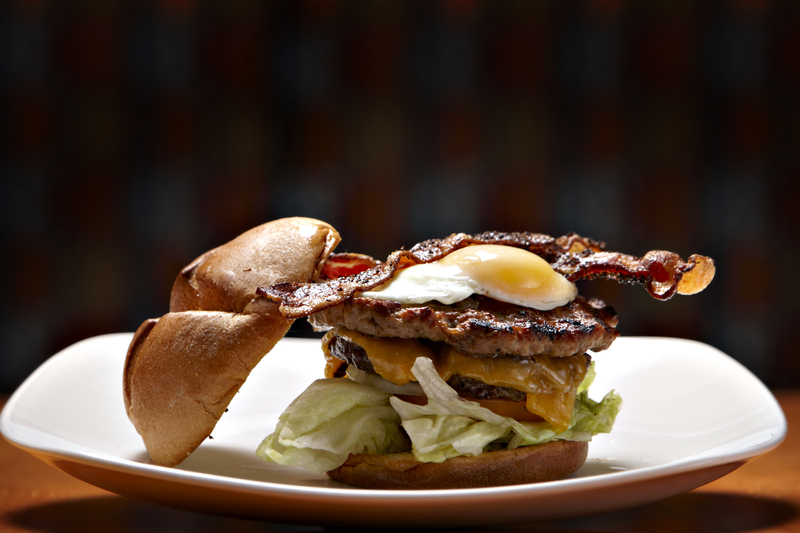 In his opinion, how can you pass up a burger topped with bacon? Everything is better with bacon. Chef Sal is also a huge fan of Mexican food, which explains why he considers the Really Mean Mexican as one of his favorite burgers. A ground beef patty is topped with guacamole, salsa, chipotle coulis, Ashe Co. habanero cheddar cheese and fried jalapeños. If you like breakfast for dinner, the Breakfast Burger is right up your alley. An everything bagel or bun from Neomonde Bakery is stacked with a 5 oz. ground beef patty, a 5 oz. sausage patty, “Hoop” cheddar cheese, North Carolina country ham, oven roasted tomatoes, pepper bacon, and a fried egg. Chef Sal’s favorite dish on Tribeca Tavern’s menu outside of the burgers are the fish tacos; blackened whitefish topped with Napa cabbage, salsa, guacamole, citrus vinaigrette, and tomato, cucumber, and black eyed pea salad. Doesn’t that sound delicious? You better believe these fish tacos are in my near Foodie future. Tribeca Tavern offers a plethora of options like brick-oven pizzas, healthy salads and down-home entrées. The menu is also kid-friendly and features classic Tribeca Tavern favorites with smaller portions. If a gigantic burger or entrée isn’t enough to curb your appetite, you’ll have to order a dessert. Rocky Top Hospitality’s Twisted Fork provides decadent desserts to Tribeca Tavern. Chef Sal’s favorite is the chocolate lava cake. It’s impossible to take just one bite; he guarantees you won’t be able to stop eating this gooey, delectable cake. So what if you eat the whole thing? Indulge yourself. 2. When I go out to eat with friends I go to: Tacos and Tequila. 3. On my iPod right now: Nothing, my iPod broke! 4. My must-have North Carolina ingredient: Bacon, this is my favorite ingredient of all time. Everything is better with bacon! 5. My worst kitchen disaster: Burnt his hand off- He was cooking over the sauté range burners and picked up the pan on the top of the burner. The handle snapped and although he was wearing a glove, he still managed to severely burn his hand. 6. I dream about cooking for: Julia Child or my grandmother, who passed away and didn’t have the opportunity to witness my cooking. 7. My favorite menu item: Fish tacos and the burgers. 8. The hardest thing to cook: Desserts, especially soufflés. The timing just has to be right. 9. Favorite attraction in Greater Raleigh: Downtown. I like to see and taste everything. I enjoy going out and trying new things. 10. In another life I would be an: Egyptian Prince. I would grow up rich and wealthy without a care in the world. Really, who doesn’t want to be one?